Colonial, Single Family - Millburn Twp., NJ Resting on .35 acre of landscaped lush property w/ mature privacy trees. 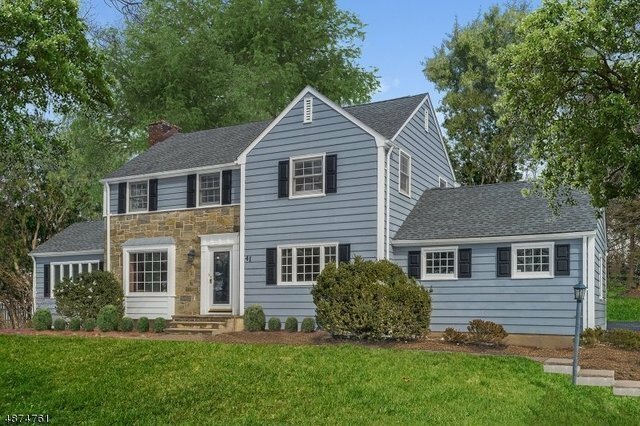 Built in 1941, updates & renovations in 2018 have transformed this classic colonial. Very low taxes with expansion potential. HWD FLRS flow throughout. The LR distinguished by its FRPL, bookcases flank the entry to the FR. A LRG window ushers in the sunlight & French doors lead the way into a sunroom. Across the foyer, the FDR is poised to host your next dinner party. The center of activity, the FR & KIT are the hub of this home. Bright & inviting, the KIT feat white cabinets topped w/ ample counter space, while SS APPL are arranged for easy access.On the 2ND LVL are 5 BDRMS w/ plenty of storage & 3 Full BTHS. The MSTR STE feat a LRG BDRM, WIC & a MSTR BTH. Partially finished LL LVL has ample storage, LNDRY, a REC RM & an office.